How to Create a Custom Windows XP for the Acer Aspire One Using nLite. I love my Acer Aspire One. I originally planned on purchasing one of the new MacBook Pro’s and bought the Aspire One simply to take notes in class. However, I really see no need to blow more money on a full-sized notebook anymore. The only downside to my Aspire is that I got the 110L with the 8GB solid-state hard drive. I’ve gone through many operating systems on my AAO, and while Ubuntu is definitely my favorite, it’s just not up to where I need it to be. The battery life is only around 2 hours, 3D doesn’t work properly in 8.10, and the wifi would crap out sometimes among other things. The only real option for me is Windows XP and I’ve installed many different versions of that as well, ranging from stock SP3 installs to nLite installs posted elsewhere on the Internet. Until now, I’ve never really been happy with the end result. A stock XP install was way too bloated and required a lot of work to remove components and tweak services and settings to work well on the AAO’s limited screen and HDD space; yet some of the custom versions I attained had features like Remote Desktop missing which I use frequently to connect to servers on my home network. Anyway, enough with the background story, I finally bit the bullet and created my own custom "Acer Aspire One" version of Windows XP using nLite. 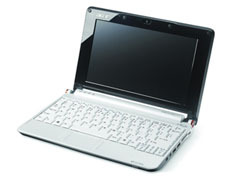 I based a lot of my removal of components off a similar guide for the Asus EEE PC here. The install ended up taking up about 600MB (down from 1.2GB) with 18 initial processes running and just under 80MB of page file usage.